This article will focus on the solution to reallocate disk space on Windows Server 2003 R2 SBS without repartitioning, reformatting or reinstalling operating system. Download IM-Magic Partition Resizer Server to reallocate disk space when system partition or other data partition has low disk space problem. If disk partition, especially system partition is lacking of free disk space, you may want to reallocate disk space. The traditional method is to repartition the hard disk to allocate more space, or reformat the partition to erase files. Nowadays, you don’t need to repartition or reformat hard disk anymore. You can rely on partition software to reallocate disk space easily. IM-Magic Partition Resizer Server is partition software for all Windows OS including Windows Server 2003 to resize disk partition so as to reallocate disk space. Download IM-Magic Partition Resizer Server for reallocating disk space from one to another freely. 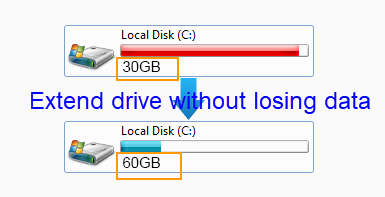 How to Reallocate Disk Space to Extend System Partition? Download, install Resizer Server, right click any partition you want to shrink. Shrink the partition and you can produce a free space, which will be shown as an unallocated. 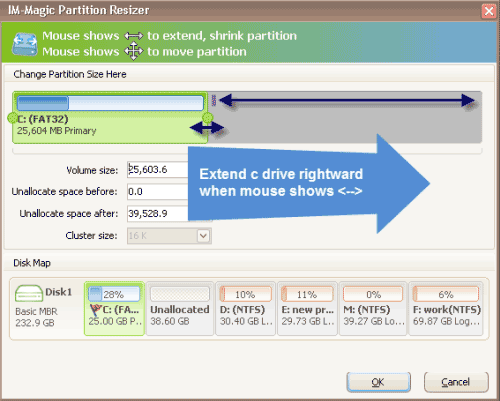 Use "Resize/Move" option to reallocate disk space to c drive or any partition you want to extend. Then click "Apply" to get system partition extended. Windows Server 2003 has built-in Diskpart command, or you may use 'Disk Management' at first to see whether it can work for you since Partition Resizer Server costs US139 to apply changes on Windows Server OS. The benefits of Partition Resizer Server is that you neither need to worry that the software will cause any trouble in the resizing process because it only takes a few seconds to complete the resizing with ROLL-BACK Tech and get it 100% safe for reallocating disk partition space from one to another. When referring to reallocating disk space, most people would think that they will need to repartition the hard disk. If you repartition a hard disk, you will need to backup disk data to another storage media because repartitioning disk may erase all data stored on the disk. - Totally free with repartitioning or reinstalling OS.